Going out to eat at a restaurant with someone with Alzheimer’s or dementia can be challenging. But preparing ahead of time can create a successful and enjoyable dining experience for everyone. Most people enjoy dining out at restaurants, including seniors with dementia. It’s also a nice activity for your older adult to enjoy with family and friends and helps them feel included. Dining out may not be appropriate for everyone who has dementia, but it’s worth a try if you feel that your older adult could enjoy the experience. We share 6 tips that help you plan and prepare when taking someone with dementia out to eat. These suggestions help avoid potential problems and make the meal easier and more pleasant. People with dementia are more sensitive to their environment. Finding a restaurant that won’t cause agitation, anxiety, or confusion helps your older adult enjoy themselves and minimizes the chances of having an incident. Choosing a restaurant with a calmer, quieter environment will likely make the outing easier and more pleasant all around. A restaurant that’s very familiar to your older adult is also a good choice since they’re likely to feel comfortable there. Aim for a place that isn’t too crowded or noisy, has helpful staff, and doesn’t take too long for a meal. It should also serve foods that your older adult likes to eat. You may also want to choose a place with an easy-to-access bathroom and if needed, one that’s large enough so you’ll be able to provide assistance. People typically feel best at a certain time of day. For many older adults, this is earlier in the day when they’re not as tired. Going out for a meal during their “best” time of day makes it more likely that it will be successful and enjoyable. For example, you may want to arrive at the restaurant for lunch as early as 11am. That also means the restaurant will be less crowded and the service will probably be faster. Or, maybe they’re better after their late-morning nap. If that’s the case, you could go for a late lunch when the crowds have thinned. If you’re going out to dinner, consider eating early in the evening. To make it easier to eat, bring the helpful items that your older adult typically uses during a meal. At the restaurant, consider asking to be seated at a quiet table or one where your older adult can sit with their back to the crowd. This can keep them from getting overwhelmed or agitated. When seated, let the server know about special needs like extra napkins or utensils. You may also want to tell them if you need speedy service or for them to bring all the food at once instead of the appetizer and entree separately. Helping your older adult to order also keeps them from getting confused or overwhelmed. Suggest one or two meal choices that you know they like, read certain parts of the menu to them, or point out one or two pictures. Using the toilet in an unfamiliar bathroom is difficult for someone with dementia. If they need to use the restroom, be sure to go with them and provide assistance to prevent an accident or any problems. Some find it helpful to discreetly hand out “awareness cards” that explain that your companion has Alzheimer’s or dementia and ask for extra patience. See an example card here. These cards can help others be more understanding without drawing too much attention or potentially embarrassing your older adult with a public explanation. You could create and print simple cards yourself, print cards from templates available for free online, or buy pre-printed cards. Older adults with dementia typically become tired easily. Keeping a restaurant outing brief helps avoid any issues caused by becoming overtired. That might mean skipping the appetizer or taking dessert to go and sticking to entrees that don’t take long for the kitchen to prepare. 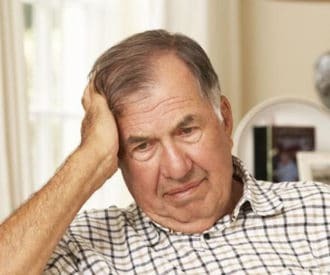 Don’t rush your older adult while they’re eating (that could cause agitation), but be on the lookout for signs that they’re becoming tired and take them home before fatigue makes them anxious, angry, or uncooperative. Helpful article except for one thing: it assumes that the person with dementia is a senior. This is not always the case. Perhaps it should be retitled “Tips for Dining Out with Someone with Dementia”. We’re so glad this information is helpful. We certainly agree that dementia affects a variety of people of all ages, not just seniors. But because the DailyCaring mission is to help families caring for older adults, we focus on issues that people caring for seniors commonly face (including dementia). We very much hope that our tips, advice, and resources are helpful to a wide range of people and situations since the symptoms and challenges of Alzheimer’s and dementia are often universal.